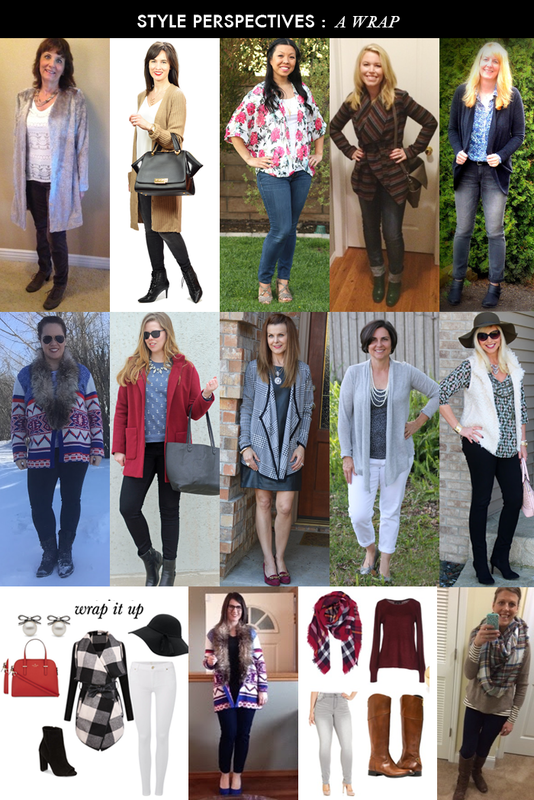 Welcome to week 2 of the Style Perspective series, where 14 bloggers share their take on a styling prompt. Be sure to visit The Blended Blog to see how the featured blogger kicks it off. You can kinda tell who lives in the great white north and who lives in the warmer climes. And can you tell which two are bffs?? I enjoyed clicking through some of the link ups and seeing how others joined in the fun. The prompt for today is “shades of pink.” I tried shopping my closet but apparently I don’t have much pink in my winter closet. I haven’t switched to my spring/summer closet yet since it JUST started warming up. So what’s a gal who is on a shopping ban to do? Go virtual shopping! Since I had received several Land’s End catalogs with several items I loved, I decided to pay them a visit. I found quite a few things that I really liked! Here are three outfits that involve a floral pattern that I really love. Aren’t they so springy? 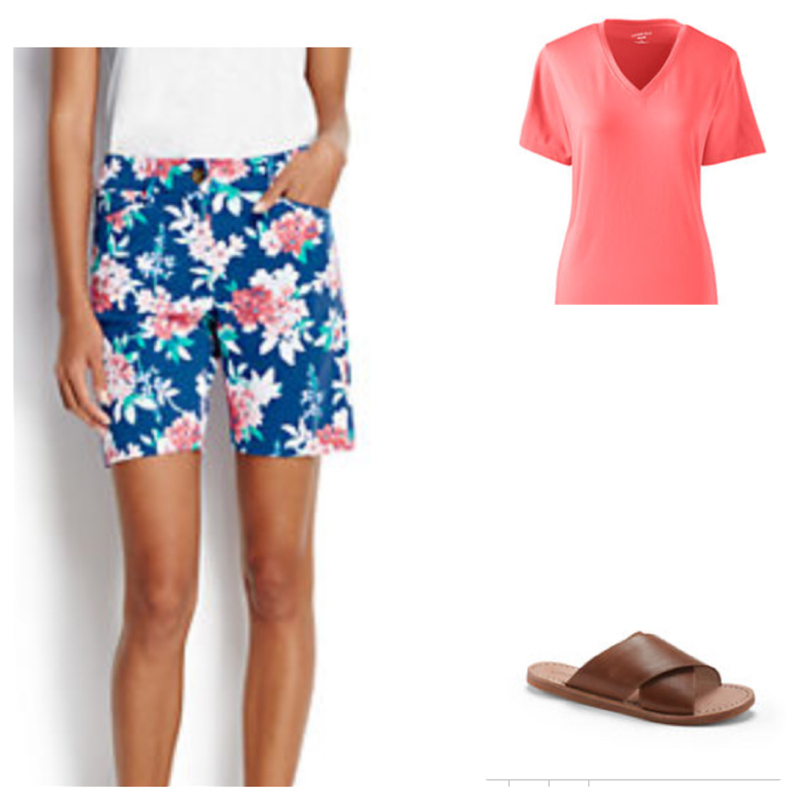 The first one would be perfect for our trip to the Keys next week: shorts with a coral top and an easy laid-back slide. The second is appropriate for a cooler spring morning: a floral top with white denim and a fuchsia sweater with a fun sandal. 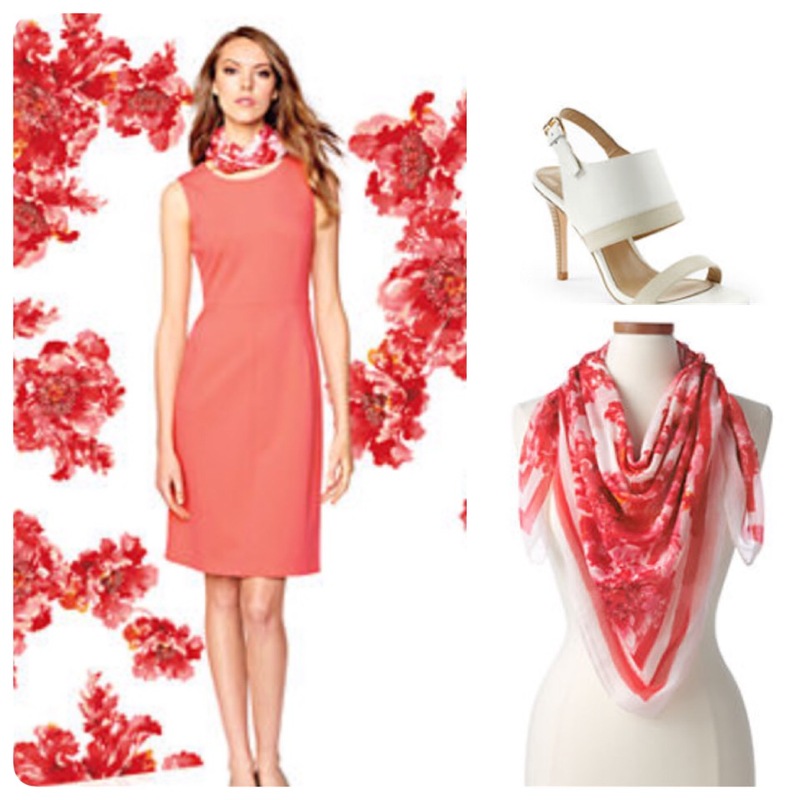 The third look is a coral shift dress with a floral scarf and oyster heels. (I really love the heels!) Wouldn’t that make a pretty Easter outfit? I look forward to when my shopping ban is over so I can add a few new pink items to my closet! I love pink in most shades: from soft shell to hot pink. I think coral may be my go-to shade for the spring! Do you wear pink? What is your favorite shade? 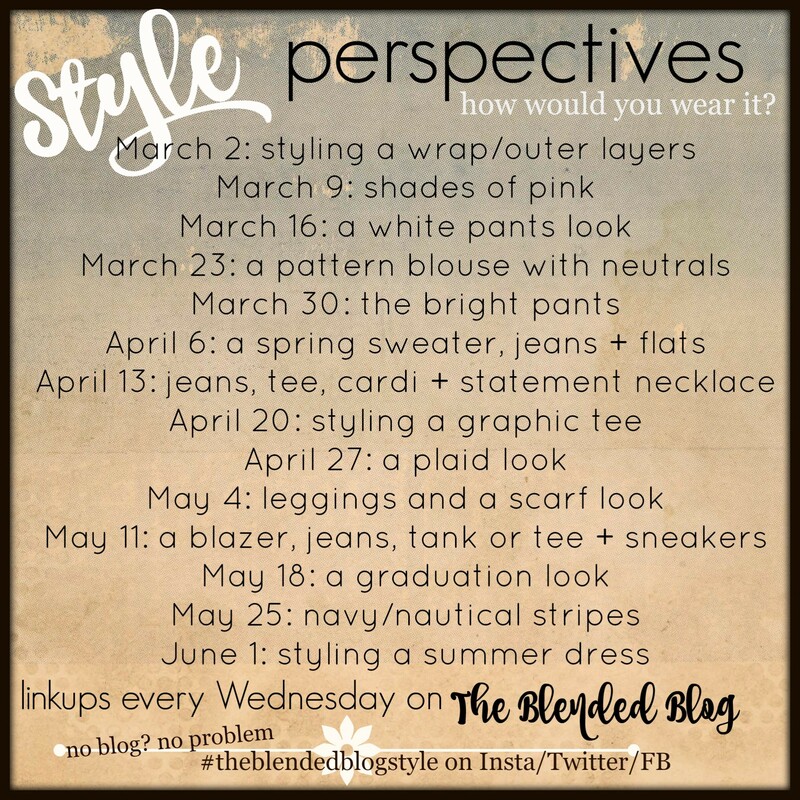 Remember that you can join in too, even if you don’t have a blog by using the hashtag #theblendedblogstyle on social media. Yay, virtual shopping…my favourite passtime when I don’t want to be correcting! Haha Deena! I don’t do it very often. I prefer in person or catalogs. That’s true Shaunacey! But it will be things I love! OMG you can totally tell where someone lives by what they chose. Very interesting observation Sheila! I really like the floral shorts you chose. Great post! I thought if was fun to see some pics with snow and others with very lightweight outer layers! Oh loved what you picked out. I think the pink dress is my favorite, I need a new Easter dress…okay I don’t NEED, but want…yea we’ll go with that 🙂 Is the shopping ban over at the end of March? Yes, the end of March. I would like a new Easter dress too. But I’ll have to wait and evaluate when I switch my closet to see if I really NEED one! I love pink but oh how coral has my heart!! So pretty and just make me smile thinking of Spring and fun pieces like these! I know that coral isn’t *technically* pink but for me it’s in the same family. Maybe a cousin? Pink with a bit of orange thrown in. Cute shorts, and I love the sandals in outfit two. I can’t wait for spring and more pink! ON had some similar shorts last year but I missed them. So tempted to get these! OOH that floral blouse. Now you’ve got me virtual shopping! I love the dress outfit too. I love that floral top! Ugggghhh. I’m tired of NOT shopping!! Lol! I love the floral shorts! Have fun in the Keys…sounds fantastic! OH man!! Love those floral bermuda shorts!! I wish I was going to the Keys!! Enjoy!! I’m looking forward to it! But first SC. My hat’s off to you, girlfriend. Way to stick to the shopping ban. Love the coral color. So beachy. So Florida. Love it. Are you still taking pics and doing the health challenge despite your FB ban? Can’t wait to see your projects in Eternal Crown. Lands’ End to the rescue! So many of their spring items are just too cute! I know!!! I really love their navy/white with pops of yellow catalog! I like that second look. I commend you for sticking with your shopping ban! It’s getting old but I’m really able to focus on what I have and how much I like it or not. The closet keeps thinning!